The cape has been running for 5 days now. I've been tweaking the system to see if I can get it stable. The red line shows the clock offset. When things are working properly, it's excellent. 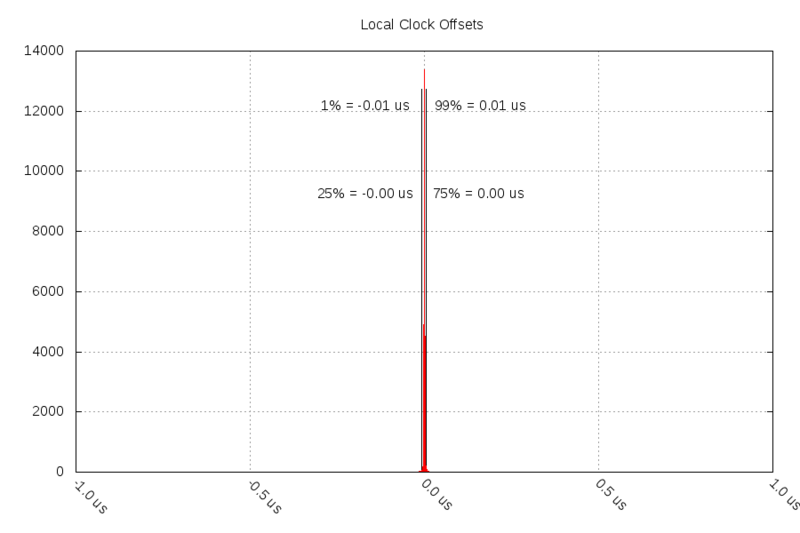 The offset is inside +/- 10ns 99% of the time. The frequency error is below my ability to measure it 99% of the time (chronyc reports "0.000 ppm" 99.78% of the time and within +/-9ppb 100% of the time). The PPS and frequency come from the same NS-T, so it isn't surprising to find they agree very closely, it's essentially measuring the NS-T against itself. But at the very least, it shows that there aren't significant errors added in frequency generation. But there's a problem. 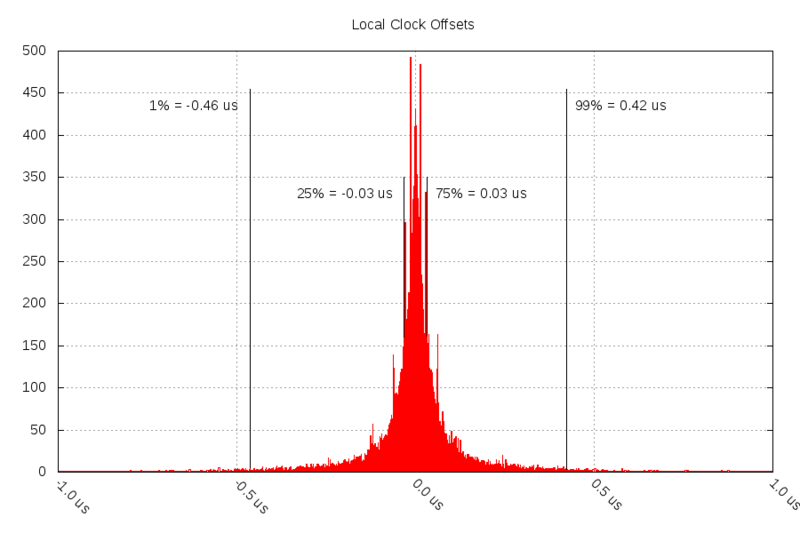 You can see there are significant "offset hiccups" that are way outside of +/- 10ns, above 45 seconds even. 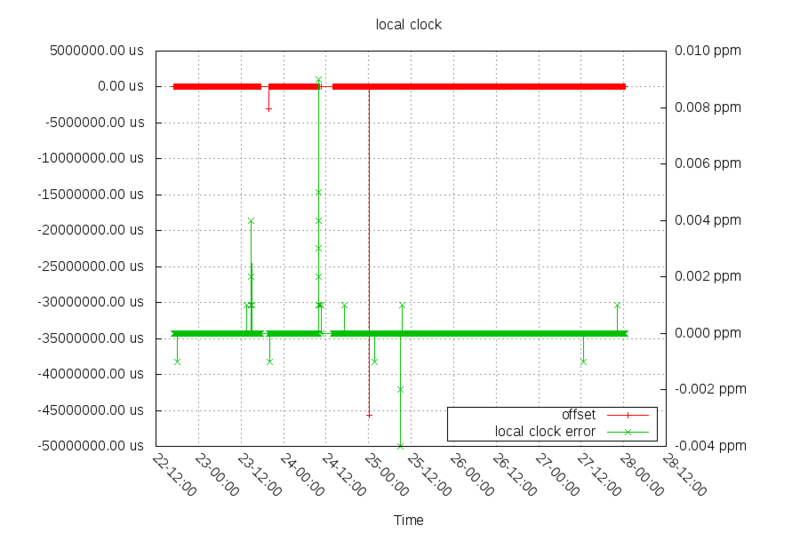 I believe the frequency output is stopping, which stops the local clock from running. I know this happens when the GPS does any type of reset, including a warm reset. I think it's also possible if there are no GPS sats with signal. I also know that this GPS will do a warm reset if its on-board TCXO changes frequency too quickly, so I've put it inside a plastic box at 24-13:58 to slow down temperature changes. It has been more stable since then, but it didn't fully fix the problem, so I'm still investigating.